Vasque Shoes - The Outdoor Recreation ThoroughBred! Vasque Shoes? Ever heard of them before? Don't feel bad if you haven't. Not a whole lot of people have. Funny thing is - Vasque, an American company has actually been around for over 45 years. It's a brand we love a lot for some pretty simple and very practical reasons. 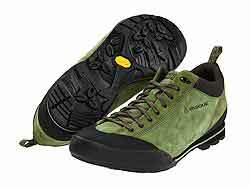 Vasque Shoes are what we call 'serious' shoes for outdoor recreation and mountaineering. OK. OK. We're not trying to get you into mountaineering (unless of course you really want to) but that just shows you these shoes are tough, durable and mean business. They last a long time! Yoko has worn her *Vasque Sundowner Hiking Boots around the world for the last 30 years! Both she and her boots are still going strong! *This model is still being manufactured and supported by Vasque even after all this time! Vasque Shoes, part of the Red Wing Shoe Company of Minnesota (itself founded in 1905), was founded by William D. Sweasy in 1965 when he saw the outdoor recreation and mountaineering craze sweeping Europe. He started designing outdoor shoes to get ready for when this craze hit North America. They have continually developed new shoes over the years and kept their commitment to 'keep their eyes firmly focused on the trail ahead'. 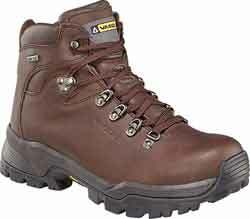 Our Vasque shoes get used for daily walking, trail walking and for the tougher trail when we 'head into the bushes'. Most of the models are best suited for walking outside of urban areas. You of course can use them for that if you wish. We do and find them especially good if you walk in a lot of 'interesting' weather. We love how they handle in slush, snow, mud, loose gravel - that sort of thing. These shoes are designed to be worked! You'll get the most satisfaction from Vasque when you do work them, otherwise it's sorta like using a Formula 1 racer to go to the corner store. Feels great but you know there's a whole lot more 'under the hood'! One neat thing we find pretty cool is that they are one of the few shoe guys that have extended widths and sizes (to Size 15) in some models. If you're one of those folks with hard to fit feet Vasque may have a shoe that fits you. This is a huge feature in specialized shoes. Check out their website for great info on their incredible shoe technology. Make sure to check out the 'Ultimate Fit' stuff there too for some really fun videos. Along with the fun, you get to learn a lot about what goes into making a good shoe these days. Their 'Fit Ninja' star is a tough task master but he really knows his stuff! Vasque products are great for a lot of the outdoor recreation type of activities. Not so great for just urban casual walking. Great for the tougher going where you want a true champion. One thing also to keep in mind is that because they are designed for more rugged use, they are a little heavier than normal. We do highly recommend them though for the more interesting trails and terrain. And of course if you think you might like to try that hiking stuff, you will love them. You may even end up having to include them in your will, they last so long! You might have to look a little bit harder for the Vasque brand. You can usually find them in the outdoors recreation shops catering to the active person, the mountaineers, campers and hikers. You likely will not find them in the big box stores. Also you should know that the specialty sports shops may only carry a few models specific to their specialized focus. For your 10% Discount when you are buying your shoes, just enter the word "Shoebuy" in the coupon code box when you are checking out. Fast and Easy. Free Return Shipping (USA only) if they are not quite right for you. And you can now have International Shipping to 45 countries.